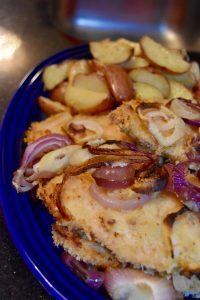 My mom’s made this recipe for years, and now I made this recipe on the regular. What’s nice is that the chicken never touches the pan, it lays on top of a bed of onions (or, if you’re like me, garlic cloves too!) and crisps up nicely and remains juicy. Feel free to sub out the chicken breast for thighs, or turkey, or even pork chops! And if you have breadcrumbs instead of panko, go ahead and use them. You’ll notice I saved the touching the raw chicken part to the very last so that you don’t have to wash your hands a thousand times between touching raw chicken and everything else. 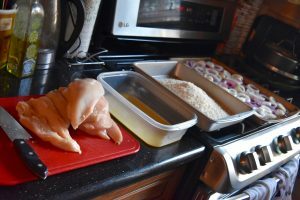 It’s always better to prepare your mis en place ahead of time, so that you don’t need to disinfect the entire kitchen from touching everything with your raw chicken hands. Serves 4-6 people, depending on how many cutlets you used. Preheat oven to 350 degrees. Prepare your breading station by lightly beating the eggs in a shallow container. Add a couple of teaspoons of milk or water to dilute a little. Add your panko or breadcrumbs to another shallow pan. Into the breading add the garlic powder, salt, and pepper to taste. Then, prepare the sheet pan that you’re going to bake in by placing a layer of the onion rings (I used red and white, use whatever you have in the house. 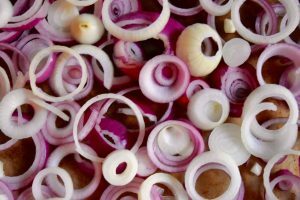 Shallots are good too but be sure to slice thick!). 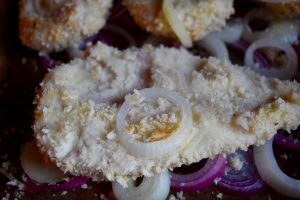 With a sharp knife, carefully slice chicken so that you have two thin cutlets vs one big one (if you bought thin chicken cutlets, skip this step). 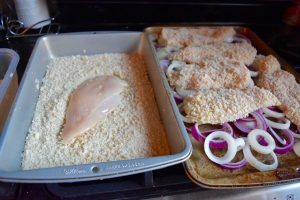 Dredge the chicken in the egg mixture, coating both sides, and then in the panko/breadcrumbs, patting to ensure the crumbs stick to the chicken. 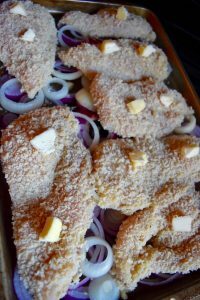 Gently lay the coated breast on the bed of onions and continue until you’ve used up all the chicken. Make sure you wash your hands!!! On top of each cutlet, place a dab or two of butter or margarine (or leave it out altogether – you do you). Bake for approximately 20 minutes, and turn cutlets over. You may want to repeat the dabs of butter on the other side. It’s totally ok if the onions stick to the cutlet when you turn them. These only help to flavor the chicken! Bake another 20-30 minutes, until browned. 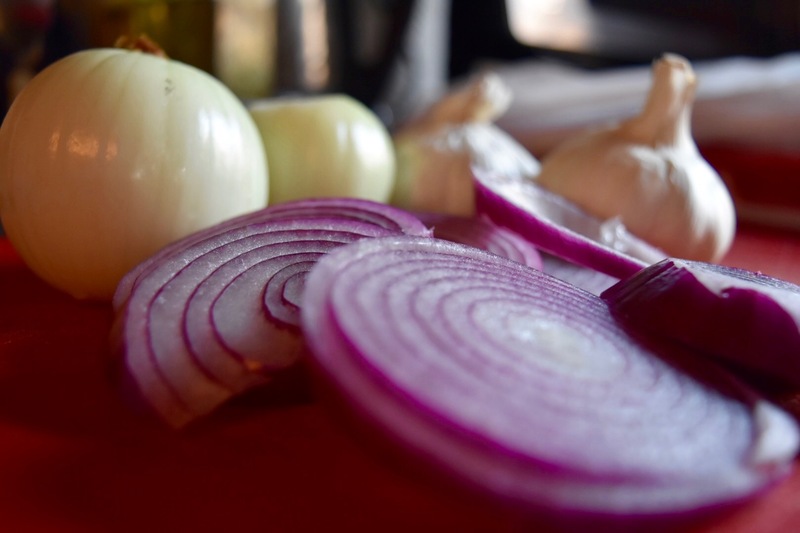 Don’t resist the temptation to eat a crunchy piece of onion as you plate the chicken – you worked hard and deserve the treat! 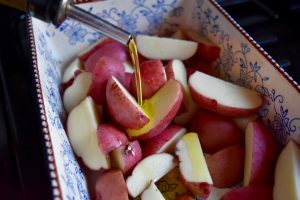 Serve with a side of red potatoes roasted with salt, pepper, and dill in olive oil, and steamed green beans.